What is a 1 rep max? A 1 rep max is the most weight you can lift once for any exercise. Knowing your 1 rep max is important as it's used to find out how much weight to use in other rep ranges. Even if you don't lift heavy on a regular basis, knowing you 1 rep max is still important. There are two ways you can discover your 1 rep max - test it or estimate it. Of the two estimations is probably the safer approach. You can test your 1 rep max, but it takes a reasonable amount of preparation, is an intense process and you run the risk of injury. Estimating your 1 rep max is easy thanks for an excellent formula which powers this calculator. 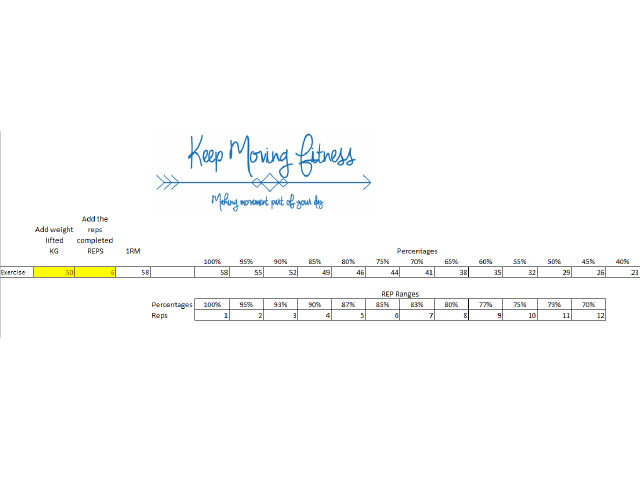 All you need to do is download the attachment and plug your weight and reps into the yellow cells, and you get your stats. You now know that your estimated 1 rep max is 58kg. You also know what your other loads for squat. Remember that you have a 1 rep max for each movement, you have to calculate them all individually. Please don’t use your deadlift 1 rep max for your bench press! Also, keep in mind this is an estimate – the lower your rep count, the more accurate estimate will be. If you put your weight for 3 reps will give you a more precise estimate than it will for 10 reps. There are many workout programs that as you to use a percentage of your 1 rep max. I often post my workouts with a percentage of my max rather than stating what weights I use. Other programs call for using 6RM, 10RM or some other amount in your rep range. Our calculator gives you a table that shows you how your percentage converts to the number of reps for those kinds of programs.